Those unsightly toes and legs may be signs of trouble lurking below your skin. Find out how you can get beach perfect this summer. Ah, sweet summer. The beguiling sunshine and soft breezes are enough to start anyone daydreaming of beaches, resorts, cruises and other vacation destinations. Swimsuit season causes us to re-evaluate our outward appearances, and in anticipation, most of us try to shed a few pounds and hit the tanning booth and nail salon. But for many others, daring to bare more skin means much more than tans, toning and pedicures. Often, those unsightly veins and feet signal underlying health conditions that must be addressed. Gilvydis, a fellowship-trained, board-certified interventional radiologist and diplomat of the American Board of Phlebology, explains that varicose veins are enlarged and bulge above the surface of the skin, caused by damaged valves that control blood flow. In healthy veins, these valves ensure that blood from the legs flows back to the heart for re-oxygenation. When the valves are damaged or fail, blood begins to pool in the legs’ veins, leading to varicose conditions that only worsen over time. At left is a leg riddled with varicose veins. On the right is the same leg, following the laser treatment. In America, varicose veins affect 50-55 percent of women and 40-45 percent of men; one out of two people age 50 or older are afflicted to some degree by varicose veins. The health effects and treatment vary depending on each individual. “Stocking therapy is pretty much old-school,” Gilvydis says. “I recommend it for simple swelling, but it won’t prevent varicose veins from worsening. 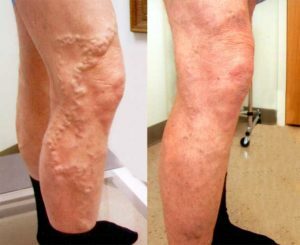 The best treatment is to eliminate the varicose veins through endovenous laser ablation [EVLA] offered at our clinics.” Unlike traditional varicose vein surgery – stripping out affected veins and leaving scars – EVLA closes the larger veins by threading a laser, mounted on a tiny tube, through a small incision and up into the veins. Laser energy then shrinks and seals vein walls permanently. Afterward, healthy veins restore normal blood flow. This minimally invasive procedure takes between 60 and 90 minutes, with the benefits occurring almost immediately. Looking good in the summer doesn’t stop with smooth, shapely legs; feet need special attention as well. It’s easy to overlook calluses, cracked heels and ragged toenails – until the time comes to bare them in sandals or at the pool. In fact, according to Dr. Ronald J. Leib, a podiatrist at Foot First Podiatry, 39 S. Virginia St., Crystal Lake, patients are more likely to ignore their feet altogether, until trouble occurs. One of the most unsightly is fungal nail infection that can cause permanent deformity. In advanced stages, fungal infections can result in the patient’s inability to wear shoes, walk comfortably or participate in sports. Leib says people need to get into the habit of checking their toenails regularly for signs of infection, including yellow and brown discoloration, thickening of the nail and buildup of fungal by-products beneath the nail. Discolored, thickened nails can separate from the underlying nail bed, become brittle and break, or develop white spots and streaking. As the infection worsens, the nail surface can become soft and powdery, or crumbly with a brown or yellow color. This newest weapon is a laser procedure that sends heat through the nail and surrounding skin, destroying the fungus and clearing the toenails. This quick, noninvasive treatment takes about 30 minutes. The downside to any toenail fungal infection, Leib stresses, is that it can take anywhere from six months to a year or longer to cure. Nail infections are caused by fungi and yeasts that take root and live in and around the skin of toenails, in the space under nails and even within the nail itself, so cleanliness is essential to both prevention and cure. Leib adds that common sense plays a huge role in how patients’ feet look and how they feel. Treating dry, cracked heels and fissures between toes is another challenge. Those breaks in the skin invite bacteria, some of which can burrow deep underneath, with resulting infections. Keeping heels consistently soft and exfoliated pays off, not only in pretty feet but also in avoiding discomfort and unsightliness. Medicated powders and sprays help to eliminate or cure conditions such as athlete’s foot, with its itchy, stinging cracks between toes. Proper foot hygiene starts with common-sense cleanliness. Wash, wash and wash again, and always wear clean socks. Summer heat leads to summer sweat, which can also lead to stinky feet. Surprisingly, so, too, can eating too much of certain foods, like onions and garlic. Metabolic reactions to certain foods may make feet smell not just especially sweaty or dirty-sock stinky, but in some cases, cause an offensive urine odor. According to the American Podiatric Medical Association (APMA), another measure to ensure good foot health is to always wear socks with shoes, both to prevent excessive sweating and to avoid sliding and rubbing that lead to blisters and lesions. Moisture-wicking socks help with sweating as well. Also, be certain to keep shoes and socks dry, and to change shoes often. Rub cornstarch or spray antiperspirant directly onto the soles of your feet, and treat shoes with Lysol to kill bacteria. APMA experts also advise to never break blisters open, and to never cut away hardened skin or calluses, but instead soak them in warm water and exfoliate with a pumice stone or file. If suffering from fungal nails, don’t use nail polish to cover discoloration, because the nails need to breathe; wear socks made of breathable fabric such as cotton. For more tips and information on good foot health, visit apma.org. Taking better care of legs and feet is wise, not only when vacations loom and the desire to look and feel great is strong, but all year long. Consistent and conscientious care doesn’t only mean stepping out proudly when the beach or boardwalk calls. It also means one less obstacle between you and enjoying all the fun and sun of summer. This entry was posted on Wednesday, June 27th, 2012 at 11:59 am	and is filed under Health & Fitness. You can follow any responses to this entry through the RSS 2.0 feed. Both comments and pings are currently closed.